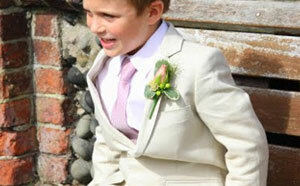 Being selected as a page boy for a wedding is a special moment for any child and will require a special suit. Never before, and probably not until their own wedding day, will a suit be this important. Page boy suit hire is generally the chosen method of purchasing a suit for a wedding, buying the suit can be expensive and that cost cannot be justified for a suit that is only to be used for this one occasion. The role of the page boy is now not as important as it used to be and is generally used as a way of included young male relatives in the wedding party. Traditional and formal weddings, however, may still use the page boys to carry the train of the bride's dress or the rings down the aisle on a pillow for the bridal party. As page boys are commonly under the age of seven, undertaking any role is not required. At most traditional weddings, page boy suit hire will be included in the groom’s side of the wedding party. It is common for the groom along with the best man, fathers of the bride and groom, ushers and page boys to be dressed in the same attire. This will mean the choice of a suit worn by the page boy being decided by the groom. Wedding suits come in a wide variety of options with different styles, fabrics and colours available to choose from. The choice of fabric and colour of the suit may depend on the time of the year that the wedding is being held. In summer weddings, a brighter coloured suit such as grey or caramel may be chosen with a lightweight fabric such as cotton or linen. Winter ceremonies may see the groom opt for a black or navy outfit made from fine wool. In terms of the style, anything goes and lounge, Edwardian and morning suits are all equally as popular. Page boy suit hire will consist of a jacket with matching formal trousers, a waistcoat, shirt, cravat or tie and handkerchief or pocket square. The accessories chosen (waistcoat, cravat and handkerchief) will be of a different colour from the suit, generally a colour that goes along with the theme of the wedding and complements the dresses worn by the bride and bridesmaids. Page boy suit hire will be done at the same time as the rest of the groom’s party. It will be important for the groom to ensure that the hire company is able to provide children’s sizes before making a decision on a suit. It is common for wedding suits to be tailored; this will involve measurements being taken of neck, chest, waist, sleeves and inseam in order to provide the perfect fitting outfit. As a page boy will have often grown from the time of first fitting, they may be required to attend further appointments so that alterations can be carried out.